Sister Marita David Kirsch, I.H.M. 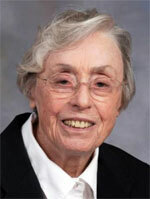 Sister Marita David Kirsch, I.H.M., died Nov. 16 in Camilla Hall, Immaculata, in the 63rd year of her religious life. She was 87. Born in Berwyn, Illinois, Sister Marita entered the Congregation of the Sisters, Servants of the Immaculate Heart of Mary in 1951 from St. Katherine of Siena Parish in Wayne and professed her vows in 1954. She taught in the Archdioceses of Philadelphia and Miami, and the Diocese of Allentown, before receiving a degree in library science. She served in the library of Immaculata University for 28 years. Sister Marita retired to Camilla Hall in 2011. The funeral Mass was celebrated Nov. 29 at Camilla Hall. Msgr. Joseph Logrip was the celebrant and homilist. The concelebrant was Father William Dean. Sister Marita is survived by members of her religious community, by her sister Ann Selma McNabb, her brothers John I. (Mary), David T. (Hannah), and many loving nieces, nephews, grandnieces and grandnephews . She was predeceased by her parents John Ignatius and Selma Ann Adelberger Kirsch, her brother Joseph P. (Lillian), her sisters Mary K. (William) Dillon, Sister June Kirsch S.N.D., and her brother-in-law James McNabb.